Although people generally have a receptive attitude towards cryptocurrency, lack of knowledge of cryptocurrency and its ability is hurting the world so much since people’s insufficient knowledge about this new innovation has made it practically impossible for them to really maximize the potentials offered by digital currency. 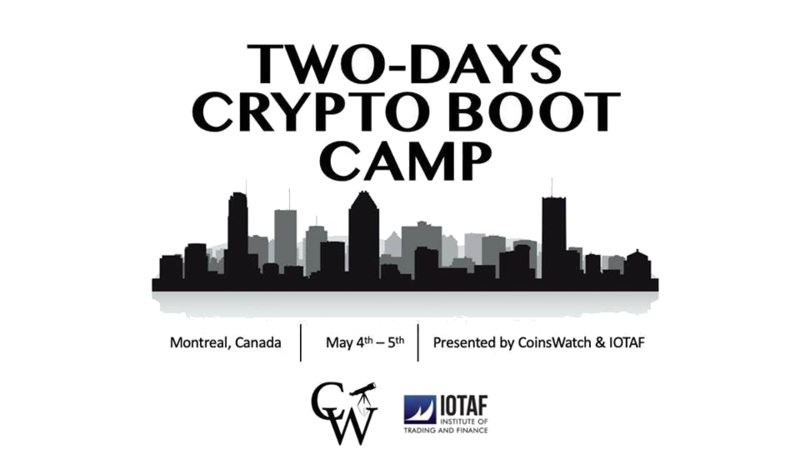 The Institute of Trading and Finance (IOTAF) and CoinsWatch, have planned a 2-day workshop from May 4 at 9 PM – May 5 at 4 PM EDT, it serves as a stage for cryptocurrency enthusiasts to replace their ignorance with full knowledge of digital coins. CoinsWatch is a one-stop hub for all things blockchain and cryptocurrency related. We offer education, consultation and research solutions for individuals and corporations. The workshop event is presented by Nabil Rochan, whose journey in finance started in corporate banking as an investment specialist and financial markets analyst, before taking an interest into day trading. Some flaws in our monetary system made room for the creation of an alternative to fiat currency. Such flaws include the difficulty of transaction, lack of transparency, and what have you. All the benefits associated with cryptocurrency are as the result on the platform on which it was built: the blockchain technology. The workshop will give you a peep into this technology. What is Bitcoin protocol? How much do you really know about the digital currency? This workshop will teach you more about the first and the most popular cryptocurrency. •	What are mines and nodes? Mines and nodes are powerful tools for cryptocurrency mining. What are they? You don’t have to wait too long before you get an answer to this. Just as you keep your fiat currency in a regular wallet, digital currency can also be stored in e-wallets. What are the different e-wallets you can choose from and what are the qualities of a reliable e-wallet? What are the roles of cryptocurrency exchanges? You will get a satisfying answer to this question and more in the workshop. Apart from Bitcoin, what other digital currencies do you know? Well, you will learn about the over 1,000 other digital coins known as Altcoins. •	What are hard forks? Hard forks are also important in cryptocurrency mining. Their significance will be the major focus when discussing this topic. You probably have heard about ICOs. Well, the workshop will discuss both the pros and cons of this concept as well. Security of transaction is one of the most important benefits of cryptocurrency over fiat currency. This is assured through Proof of Stake or Proof of Work. Which of these is superior to the other? You will learn the differences between the two during the workshop. If you are interested in increasing your knowledge of cryptocurrency with a view to getting the best out of this powerful alternative to fiat currency, it is advisable that you attend this information-packed workshop. Registration is extremely simple as well. You can also put a call to 514-439-8644 to book a space and enjoy the workshop. You are just a call away from this life-changing workshop that starts on May 4th, 2019 at 9 PM – May 5th, 2019 at 4 PM EDT.